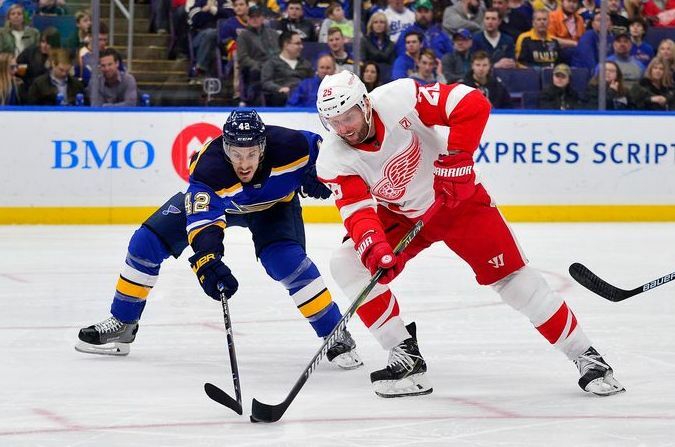 (ST. LOUIS) – Ivan Barbashev's parents and younger brother traveled from Russia to watch him play for the Blues on Thursday night. The 23 year old center made the long trip worth it. Barbashev recorded his first career NHL hat trick to lead St. Louis to a 5-2 win over the Detroit Red Wings. Oskar Dundqvist and Pat Maroon also scored for the Blues, who have points in their last four games. Rookie Jordan Binnington made 20 saves, improving to 19-4-1. The win gave the Blues 86 points as they attempt to hold on to third place in the Central Division over Dallas, who lost at Colorado and has 82 points. Thomas Vanek scored twice and Jonathan Bernier made 19 saves for the Red Wings, who had their two-game winning streak snapped.